It would be really useful to know the short list of fundamental factors that professional Forex traders use when making trading decisions. The problem is that no such list exists, or at least it does not exist for long. The list is constantly changing, depending on whatever factor is uppermost in the mind of the global investing community at any one moment in time. The reason for this sad state of affairs is that we do not have a single unified, coherent theory of what determines exchange rates. Academic economists have made a complete hash of exchange rate theory and left exchange rate determination to the whims of a market that nearly always disrespects what the ivory-tower crowd is writing about. The disconnect between theory and practice in the Forex market is the widest of all the markets. At least in equities and commodities, we have a clear picture of what drives supply and demand. It is a lot trickier in Forex. Under floating exchange rates, as we have in the major economies today, investors and bankers will continue to fund a rising trade deficit only if they are compensated with extra-high rates of return (interest rates). Extra-high rates of return have the domestic effect in Country A of stifling demand and thus inflation. Eventually a basket of goods in Country A returns to price parity with the identical basket of goods in Country B. This is named purchasing power parity, a powerful and seemingly logical concept. Every year, The Economist magazine publishes a Big Mac purchasing power comparison that shows what each currency should be worth in dollar terms to equilibrate the cost of a Big Mac in some 80 countries. You can see the under- or overvaluation of every country’s currency against the four majors (dollar, pound, euro, and yen) and also the Chinese yuan. Here is the idea: if the Big Mac costs more in Country A, the currency is overvalued. If it costs a lot less, it is undervalued. Sometimes — quite often, in fact — the next year we see the overvalued currency having adjusted downward and the undervalued one having adjusted upward. International organizations like the World Bank calculate purchasing power parities, as well as some of the big banks. The European Commission tracks purchasing power in order to track the progress of price convergence, a primary goal. The basic problem with purchasing power parity is that equilibrium is a fiction invented by economists. It is a state of balance that is never actually achieved, nor is it achievable in the real world. For one thing, every country has a competitive advantage that means its costs are permanently lower for some sectors and goods. For example, the USA will always be able to produce grains more cheaply than Japan due its huge farmlands and economies of scale. The emerging markets of Asia, including China, have sharply lower labor costs in the manufacture of clothing, among other items. The equilibration process will take decades, if it is ever possible at all. Champagne can come only from France, and fine engineered industrial machines are made in Germany. The USA invented the auto industry and produced more cars in 1960 than Germany, but today Germany produces more autos than the USA – with one quarter the population. You would be hard-pressed to find a correlation between the reversal of fortunes of the USA and German auto industries with the exchange rate, since over this period the German currency, whether the Deutschmark or the euro, was mostly on an appreciating trajectory. The rise in German exports, according to purchasing power parity, should not be occurring. Moreover, we are not really sure what to measure. What, exactly, is the typical basket of goods? The basket of goods of the average industrial company or household in Japan is not the same as the basket of goods in the industrial company or household in France or the UK or the USA. Efforts to make the baskets roughly equivalent are chock-full of factual flaws like difference in quality and are seemingly always out of date. For example, the USA is seeing a resurgence of interest in artisanal and locally produced goods, from hand-milled soap to sustainably-produced textiles. The Japanese believe domestically grown rice has properties that Louisiana rice will never have at any price. Relative cost is secondary to these “quality” factors. Another factor is that services are, on the whole, not tradable across borders. Restaurant meals, haircuts, lawn-mowing and a host of other services are confined to a single economy. Note that services make up over 65% of the US economy. Whether the dollar appreciates or depreciates against other currencies has no effect on wages or other costs of producing services. Finally, Japan has run a trade surplus with the US and rest of the world for over three decades, until recently, and yet the Japanese yen has appreciated from near 300 to an average of about 100 (as measured by USD/JPY rate) since 1995. A persistent surplus implies the yen has been undervalued, but instead of falling, the yen has been rising. Failure to equilibrate either the trade balance or the currency implies a very big failure of purchasing power parity in the real world. Do traders heed purchasing power parity? No. It is a curiosity, but we doubt that anyone ever made a trade on the Big Mac index. However, let’s consider one of the recent contributions to the Big Mac Index. In February 2014, The Economist added the Vietnamese dong. 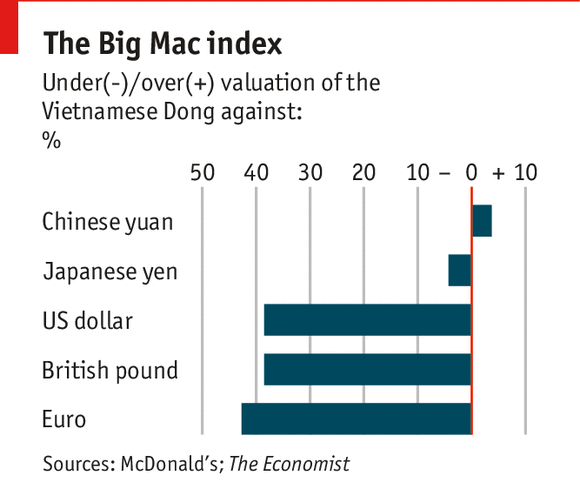 Vietnamese dong upon its addition to Big Mac index. Image by The Economist. Since a Big Mac costs 60,000 Dong, or $2.84 at market-exchange rates, compared with $4.62 in America, our index suggests the Dong is undervalued by 39% against the dollar. The currency, which is loosely pegged to the dollar, has been stable since June when the country's central bank depreciated it by 1% against the dollar to help improve the balance of payments. Keeping the exchange rate low has helped boost exports. Vietnam's trade balance turned back into surplus in 2012. Better underlying economic fundamentals should support the currency. Inflation has fallen from nearly 30% in 2008 to 5-6%. Last year Vietnam's trade deficit with China, its biggest trading partner, increased by 45%. Our index reckons the Dong is currently 4% overvalued against the Chinese yuan. This is a fascinating combination of factors. The dong is hugely undervalued against the dollar (which helps exports to the USA) but overvalued against the Chinese currency and running a deficit with China. What is the first thing we want to know? If the yuan is undervalued by 41%, it has to be “What is the trend in the dollar/yuan?” Until February 2014, the trend in dollar/yuan has been downward — the yuan has been appreciating. In February and March of 2014, the Chinese government has encouraged a two-way market (down as well as up) and a wider variation band. We might expect that if the Vietnamese want cut their deficit with China, they will need to devalue the dong more than China devalues the yuan, even though their big trade surplus with the US and sharp drop in inflation does not justify any more devaluation against the dollar. In other words, the Chinese are giving the Vietnamese a headache. You may deduce from this example that purchasing power parity is more useful in evaluating developing and emerging market countries than advanced economies, and you would be right. If you plan to trade these currencies, you are welcome to follow purchasing power parity studies. Nevertheless, for trading the majors, PPP is of little forecasting help. Another assumption made by academics that infuriates real world traders is the idea that interest rates, or the return on money, is “naturally” the same everywhere. If money is more expensive in one country, it is only because international investors foresee a fall in the currency against other currencies that will restore the equilibrium, or so says the theory. In this case, the equilibrium is that principal plus interest in Country A should always equal principal plus interest in Country B. This is named the interest rate parity theory. The economists’ assumption that the chief purpose of cross-border capital flows is to equilibrate exchange rates is ridiculous on the face of it. In fact, international investors seek higher yields in foreign markets despite knowing that eventually those flows may cause a currency to change to their disadvantage. The reason the interest rate parity assumption is wrong is a fatal disregard for relative risk in each market, and risk analysis takes into consideration other factors such as variety and liquidity preference. One reason the USA is a desirable investment destination is not only the size of the economy and rule of law, but also the tremendous size of markets as well as variety of types of investment vehicles and their risk profiles. While investors obviously are not motivated as theorists assert, the fact remains that interest rate parity does work, at least most of the time. If all other things are equal (like growth and inflation rates), an interest rate hike in Country A relative to rates in Country B should cause Currency A to fall, keeping the total rate of return, factoring in the currency value, more or less equal. Historically, we do see long periods of time when the relative interest rate differential is highly correlated with a particular currency pair. Remember the problem with purchasing power parity and the USD/JPY? It is solved when you chart the US/Japan 10-year interest rate differential against the USD/JPY. The correlation is very high. It is also high between the USD/GBP, USD/EUR, and other developed country rate differentials. It is one of the enduring mysteries of the modern world, overflowing with superfluous information, that nobody publishes interest rate differentials as a stand alone data series. You can get interest rates of all maturities for each country but you have to do the arithmetic yourself. A refinement of the interest rate parity assumption is that in times of relative calm, markets assume that the 10-year note is the relevant interest rate to look at. In times of turbulence, like the financial crisis of 2007-08, the two-year becomes the most-watched differential. It is critical to note that what works among peers in the developed countries is entirely different in emerging markets. It is more than a difference of scale — it is a difference in kind. Investors who borrow in relatively cheaper developed country money markets in order to invest in relatively higher yielding emerging markets are carry-traders. They are not buying the emerging market currency for any reason other than to take advantage of its higher rate of return. The higher the rate, the more attractive the currency — within limits. An investor may like the 8% return in, say, Turkey but shun 38% in Nigeria because of Nigeria’s country risk, or the risk of fraud, expropriation, accounting errors, and other problems either real or imagined. This leads us to the observation that risk appetite operates on a sliding scale. The carry-trader is by definition a speculator seeking a return higher than he can get at home and prepared to take extra risk to get it, including the risk of devaluation in the carry-trade investment that will wipe out his extra advantage. In times of relative calm, risk appetite is high and capital flows to emerging markets, funded by lower cost currencies like the dollar, Swiss franc, and yen. Ironically, capital flows to emerging markets has the perverse effect of causing their currencies to rise, not fall, as the interest rate parity theory demands. Countries like Brazil complained bitterly when the US Federal Reserve cut interest rates to zero because hot money flows to Brazil were pushing inflation as well as lifting the currency, harming exports. Brazilian Finance Minister Mantega used the term “currency war” at a G20 meeting in 2010. Carry-traders were getting a double benefit, not only the higher yield, but also currency appreciation. The problem with the carry trade is that traders assume that any devaluation will be less than the extra yield they are getting, but in a suddenly turbulent period, as during the 2007-08 financial crisis and again in the first quarter of 2014 with the Russia/Ukraine/Crimea situation, risk aversion rears its head and emerging markets see a rapid devaluation as hot money flows out — in the absence of any change in the interest rate differentials. Funding currencies like the Japanese yen can find themselves suddenly appreciating in leaps and bounds as carry trades are unwound and the money is repatriated. We may accept that the world is divided roughly into developed countries with relatively slow growth and low but stable interest rates, and the emerging market world has higher growth and higher rates of return — and never the twain shall meet. However, sometimes a developed country can behave like an emerging market if risk sentiment is at an extreme. Let’s take the case of “The Two ECB Rate Cuts.” In November 2011, the ECB cut its benchmark rate and instead of buying the euro, as the parity theory calls for, traders sold it. The euro fell not because Europe was offering a relatively lower rate of return, which might seem logical, or even that it had become a funding currency for carry trades (although it probably did), but rather because the peripheral sovereign debt problem was still blazing. At that point, yields on peripheral country bonds were vastly higher than US notes or Bunds because investors demanded extra yield in case the eurozone were to break up. Now consider the case of November 2013, when the ECB cut rates again. By then the peripheral sovereign debt crisis was mostly over. Ireland was able to return to the private bond market to high demand and lowish coupons. Portugal, Spain, and Italy were issuing paper without a problem and at lower rates than had been available in years. The international press was trumpeting that the peripheral sovereign debt problem was over. This time when the ECB cuts rates, the euro rose. In the 2011 case, risk sentiment interfered deeply with the interest parity assumption. In the 2013 case, interest parity worked as theory said it should, equilibrating principal plus interest across borders. A more refined and workable interest rate parity theory would incorporate risk sentiment. The economist’s rule “all other things being equal” is fatal in this, as well as other, cases. All other things are hardly ever equal. We started out with inflation in the purchasing power parity case, saying it would drive a currency down. This is because no one, whether a consumer or an investor, wants to hold a diminishing assets. Consumers rush to spend devaluing currencies, worsening the devaluation, and investors exit for higher “real” returns, “real” meaning after inflation. Now introduce economist Milton Friedman’s monetary theory that asserts “inflation is always and everywhere a monetary phenomenon.” Friedman was building on the ideas of Irving Fisher, the University of Chicago economist who said money supply times the velocity of money (turnover) is equal to GDP times the rate of inflation. Bottom line, a rise in money supply that is excessive for an economy results in inflation. For decades after monetarism became widely accepted in the 1960’s, financial markets watched inflation as the sole predictor of central bank interest rate decisions. This was cemented during the tenure of Paul Volcker as a chairman of the Fed in 1979 and 1980, when he raised interest rates repeatedly to starve inflation. It worked — Volcker cut the inflation rate back to an acceptable level. Ever since then, financial analysts have watched inflation rates as the single most powerful indicator of upcoming central bank policy decisions. When inflation is low, central banks are assumed to leave rates alone. If it is rising, they are assumed to be thinking about a rate hike. Today, in 2016, we have the opposite problem — inflation that is too low and potentially turning into disinflation or deflation. The bias of analysts is to expect rate cuts instead of rate hikes. Since the financial crisis of 2007-08, only a few developed countries have risked a rise in interest rates. When the Fed started cutting interest rates during the financial crisis of 2007-08, it was not because inflation was falling. It was because the economy was falling and falling hard and fast into a Great Recession. Lower interest rates were supposed to goose the economy back into first gear from a dead halt. In this instance, it was the failure of some financial institutions and the subsequent collapse the US housing market that triggered the crisis. In Europe, the central banks lowered rates at least in part because of the peripheral sovereign debt crisis. Some central bankers would like to see higher rates to dampen speculative excess that may be encouraging bubbles in some asset classes. Bottom line, inflation may be the key favor in central bank decision-making, but it is not the only factor. In order to divine central bank intentions. Forex traders watch the factor of the moment, whether it is recession-related unemployment, housing prices, financial institution stability and sustainability, sovereign debt capacity, and so on. This is why at the beginning of this lesson, we said Forex traders follow an ever-changing list of fundamental factors. Trade deficits and interest rates alone do not explain as much as we need to see. Traders do watch trade balances and inflation rates for a rough, general overview of how a currency should be priced, as a nod to purchasing power parity, but you will not find professional traders seeking out PPP as a key indicator on which to base a trading position. Traders watch inflation more as a clue to future central bank monetary policy, since a rise in rates tends to cause a currency to fall as an equilibrating factor. The equilibration works only in some cases and even then only some of the time, and you will not find easily accessible data on interest rate differentials, even though differentials are the one solid Forex determinant in a sea of data of that is only partly relevant. 1. Purchasing power parity says prices should be the same in all countries for the same goods and services. The US cheats in international trade by subsidizing exports. Brazil wants the US to raise interest rates. a higher nominal rate of return. a higher real rate of return. the ratings agency's rating of the country’s bonds. the 10-year yield differential with the main trading partner.